Discover your passion and make a difference with a minor in sustainability. Dig into experiential, hands-on coursework in and out of the classroom that has positive and immediate impacts on families, communities, organizations and businesses — and create a lasting model of change for future generations. 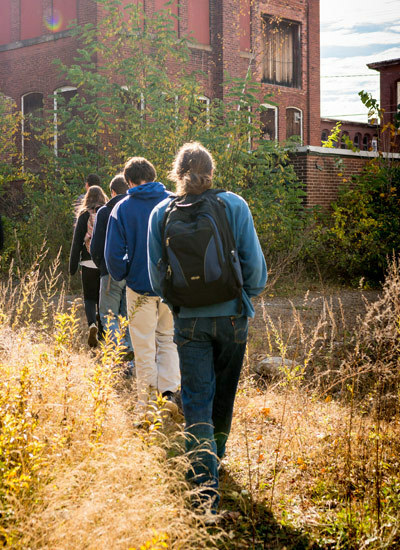 Combine interdisciplinary learning on campus with hands-on experience revitalizing the nearby city of Franklin, N.H. The Sustainable Learning Initiative Franklin Falls allows you to work with community stakeholders to address real and evolving needs by developing solutions using the principles of permaculture and sustainability. You will have a hand in creating a model of mindful revitalization that can be replicated — helping to ensure a sustainable future for all. Whether on campus or in the field, you will learn about resilience and regeneration, land-use planning, economic development, energy use, transportation, food systems and resource management, while developing skills in leadership, group dynamics, problem solving and conflict resolution.